One of the hardest parts of planning a wedding is picturing what everything is going to look like: flowers, decor, your hair and the cake! The cake is one part of the wedding planning process that I didn’t think about too much until Barbara from Brigalias asked what we wanted. I had no idea! Danny is the sweets person so I decided to let him have some say in this aspect of the planning process. I thought for sure he would go with a red velvet, but he decided to go with a simple pound cake that everyone would be able to enjoy. After looking through all of our options for the design of the cake, I still could not decide on what it was exactly that I wanted it to be. Then I found the paisley design – it was a cake with white icing and colorful paisley- this particular picture in the album at the venue was purple. Since I had already talked to my amazing florists- Dawn and Mary at A Garden Party Wedding Florists, and decided that we would have a stream of fresh flowers cascading down the side of the cake, I thought this might work! The piece that really pulled the flowers and paisley together was our decision to have white paisley accents instead of purple. 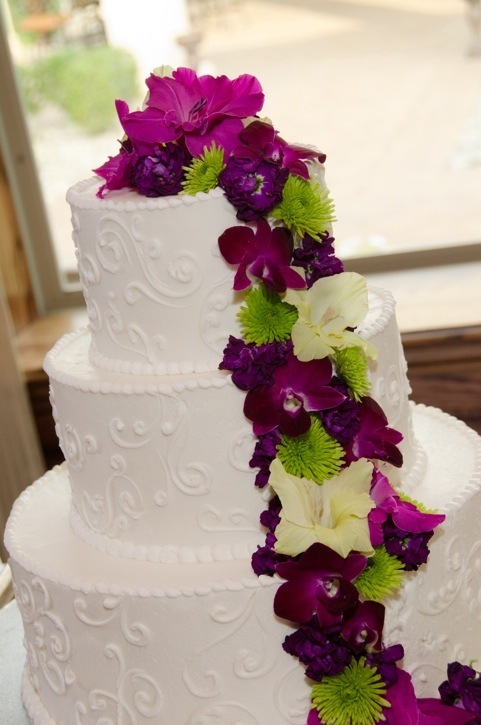 I think it gave the cake a classic, textured look and the flowers completed the whole ensemble. I couldn’t have been happier with not only the way that the cake looked, but the taste was wonderful as well! I was in good hands with the ladies at Brigalias and A Garden Party Wedding Florists. Just what I never knew I always wanted! It was very elegant, just like you…put a pic of you and Danny eating it on your blog too! We did so thank YOU!